Yongkang Jiangnan Enamelware Co., Ltd. In the past, this product range has been rather costly to produce due to its high production technology, aluminium products can now be manufactured by forging, which gives the same features as cast aluminium but at much more affordable production costs. At the same time, cookware with induction capabilities has become widespread as a result of the ever-rising popularity of induction hobs. In our aluminium cookware factory, our technical experts have successfully adopted techniques for producing forged aluminium products with 18/0 impact-bonded bases, which continue to be supplied in large quantities to our customers. Group is a leading manufacturer of electrical household appliances, electronic scales and plastic house wares in Shenzhen, China. Group now owns 4 factories and has more than 2,000 kinds of products exported to more than 30 countries and areas. Our products are sold to well-known clients such as Walmart, QVC, Carrefour, Metro, Sunbeam, Tefal, Ariete, Solac, etc. Jinhua Linghang Kitchen Industry Co., Ltd.
We are one of the leading factories in innovation and creating new products. 95% of our products are exported to Europe, Southeast Asia, Africa, UAE and other Middle East countries and the rest are sold in the domestic markets. We do our best to not only retain, satisfy and support old customers but also to find ways of attracting new customers and markets. Zhejiang Fukaimei Industry And Trade Co., Ltd.
Hebei Chang'an Ductile Iron Casting Co., Ltd.
3. Steel handle and mushroom style knob, heat insulation performance is strong, not hot. -- We have a certain production scale and experience in export business . And our professionals help to ensure the specific quality standards. Zhejiang Huochu Cookware Co., Ltd.
Yongkang Wellmade Industry & Trade Co., Ltd. If you need more information, please contact our customer services,and we also accept customized. Q: What is your minimum order9 A: Most products, our minimum order is 200 pieces. Q: What is your delivery time9 A: We will delivery within one month after received advance payment. Yongkang Yishun Industry And Trade Co., Ltd.
Ningbo Ablespring International Trading Co., Ltd.
Zhejiang Wuyi Haotian Industry & Trade Co., Ltd.
Yongkang Youlian Machinery Co., Ltd. Wooden or plastic utensils are Scratches do not influence the function of the pots and pans in any way. After washing in a dishwasher and before the next use, rub the pots and pans with a few drops of cooking oil. Discolouration of the bottom of the pots and pans is harmless aluminum oxidation. Zhejiang OSFE Industrial Co., Ltd.
4. It is available to develop the new items according to your design or artwork. 6.We have perfect after-sales service ,we will try to satisfy any of our customers. Q3: What about the lead time for large production9 A: Honestly, it depends on your order qty. 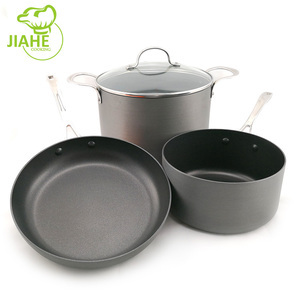 Lanxi Hanver Trade Co., Ltd.
Alibaba.com offers 29,446 aluminum cookware set products. About 74% of these are cookware sets, 3% are soup & stock pots, and 1% are casseroles. A wide variety of aluminum cookware set options are available to you, such as ce / eu, fda, and lfgb. 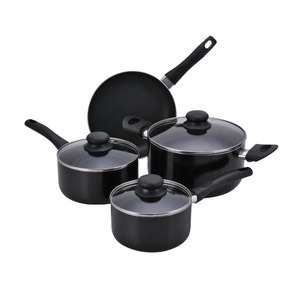 You can also choose from cookware sets, soup & stock pots. As well as from eco-friendly, stocked. And whether aluminum cookware set is metal, ceramic, or glass. 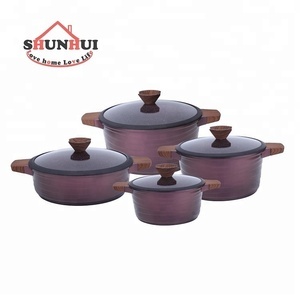 There are 28,912 aluminum cookware set suppliers, mainly located in Asia. The top supplying countries are China (Mainland), India, and South Korea, which supply 96%, 1%, and 1% of aluminum cookware set respectively. 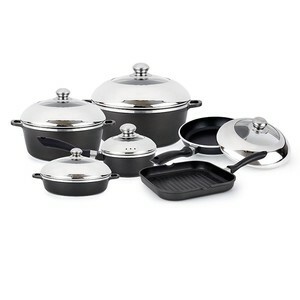 Aluminum cookware set products are most popular in North America, South America, and Western Europe. You can ensure product safety by selecting from certified suppliers, including 6,507 with ISO9001, 2,763 with BSCI, and 1,916 with ISO14001 certification.